Imagine sunglasses that can withstand the severe cold and heat of space, a barrage of radiation and high-speed impacts from small space debris. They don't exist, but Northrop Grumman engineers have created a Sunshield for NASA's James Webb Space Telescope that can withstand all of those elements. The space telescope needs a Sunshield to block heat from the sun so its cameras and instruments can operate properly a million miles from the Earth, when it launches in 2013. Any satellite that flies in the depths of space has to be able to withstand the rigors of space, including the icy cold or the intense heat and radiation of a solar flare. Temperatures in space can range from a super-hot 400 K (260 F) to a frigid 30 K (-406 F). In addition, the Webb telescope's Sunshield will be bombarded with tiny meteorites (sand-like grains) and radiation in space, so it has to be tough. It has to stand up against those things, as well as tension and aging under the extreme space environments. 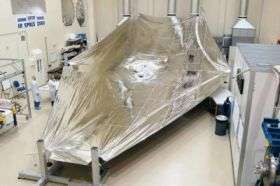 "The Sunshield's 'aging' occurs from extreme sunburn," said Mark Clampin, NASA's Webb Telescope Observatory Project Scientist at Goddard Space Flight Center, Greenbelt, Md. Blocking light and heat from the sun will keep the observatory operating at cryogenic (cold) temperatures, enabling its infrared sensors to see distant galaxies, early stars, and planetary systems. That's important because infrared sensors actually measure the heat given off from far away galaxies and stars. Shaded and protected from the Sun, the Sunshield allows the telescope to cool down to a nice and chilly 40 K (-387 F). Any warmer than that and the heat given off from the telescope would corrupt the data. "If you could imagine, this would be like going outdoors applying sunscreen of 'SPF' of 1.2 million on your skin," said Martin Mohan, Program Manager for the Webb Telescope at Northrop Grumman, Redondo Beach, Calif. "Previous to this crucial technology, materials with thermal properties that reflect the sun without being heated did not exist." Jonathan Gardner, NASA's Deputy Senior Project Scientist for the Webb Telescope at Goddard said "Infrared is heat radiation. In order to see the faint glow of infrared heat from distant stars and galaxies, the telescope has to be very cold. If the telescope were heated by sunlight or the warm glow of the Earth, the infrared light emitted by the telescope would outshine its targets, and it wouldn't be able to see anything." So what are these super-tough Sunshields made of? These super-tough Sunshields are made from a polymer-based polyimide film, DuPont™ Kapton® E. What's most impressive about their strength is that each Sunshield "membrane" layer is about as thick as a human hair (one to two-thousandths of an inch thick). The layers are separated from each other and held in place at the center and tensioned by six perimeter booms and perimeter cables. There are five layers of the Sunshield in all. An alloyed silicon coating is applied to the sun-facing side of the two lowest layers (Layers 1 & 2), while "Vapor Deposited Aluminum" is coated on the rear surfaces of Layers 1 and 2 and both surfaces of Layers 3, 4 and 5. The semi-conductive silicon coating is very good at reflecting the sun's energy while the nice and shiny aluminum layers are chosen to reflect out to space any of the sun's heat that does get by the first two layers. These coatings and Sunshield geometry work together to reduce the 250, 000 watts of the sun's energy that hits the first sun facing layer to less than 1 watt by the time it works its way to the fifth and last layer. The continuous production of coating the Kapton E film is done by Northfield, Minn. based at Multek Flexible Circuits (Sheldahl Technical Materials). The fabrication of the Sunshield membranes is performed by the Huntsville, Ala. based Mantech-SRS Technologies and integrated with the Sunshield structure at Northrop Grumman's Space Park facility in Redondo Beach, Calif. In order to demonstrate that the membrane material and basic construction seams will retain their thermo-optical and structural integrity, a 6-year development and testing program was performed by Northrop Grumman, the main contractor on the James Webb Space Telescope. The program's purpose was to show that the membrane material performs well in all relevant operational environments. In those tests, basic mechanical properties of the Kapton E material were measured at extremely hot and frigid temperatures and under simulated space radiation at Aerospace Corporation. Other radiation exposures were done at University of Dayton Research Institute and NASA Marshall Space Flight Center's Solar Wind Facility, Huntsville, Ala. to evaluate the stability of the membrane coatings. Hypervelocity impact tests up to 12 kilometers per second (7.4 miles/second) of meteoroid-like sand particles were performed on tensioned, irradiated membrane material at extreme hot and cold temperatures at Auburn University's Hypervelocity Impact Facility. The durability of the thin coatings was also demonstrated under representative ground handling and packaging/deployment environments. The strength and durability of membrane seaming joints and other design features were also tested under irradiated, extreme temperature environments, as was the resistance to tearing of the Kapton E. The materials passed all the tests. Each layer of the Sunshield is about 150 meters2 (~ 1600 feet2) or approximately the size of a tennis court. Recently, at Northrop Grumman, in Redondo Beach, Calif. a 5 layer Sunshield test sample was being folded and deployed to validate design concepts. The materials are so large that when stretched out, it looks like a giant spider web. Clampin said "To imagine how the Webb telescope Sunshield will appear, imagine 5 Sunshield layers the size of a tennis court and the thickness of a candy wrapper. The Webb telescope's Sunshields present new challenges, for instance how do you fold a candy wrapper the size of a tennis court?" That's exactly what Webb Telescope engineers have figured out. Due to its large size, the Sunshield must be compactly folded, much like a parachute, around the telescope in order to fit it into its launch rocket. Once it's on the way to its final orbit, approximately 1 million miles from the Earth, engineers at Northrop Grumman will issue commands to the Webb telescope to unfold the Sunshield.